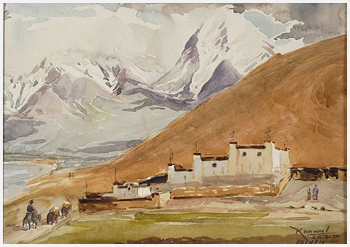 1930 Studied at Benaras Engineering College, but gave up his engineering studies for art. 1933-39 Diploma, Govt. College of Art and Craft, Kolkata. 1953 Worked under William Hayter for three months and studied basic techniques of the graphics medium, Paris. National Gallery of Modern Art, New Delhi. Ministry of Defence, New Delhi. Gottinghan University, Germany. Lancashire University. Gray Foundation, USA. Chitrakala Parishad, Bangalore. Hyderabad Museum, Hyderabad. R.P.G Enterprises, Bombay. Duncan House, Calcutta. Reliance Industries, Bombay. Governor`s House, Orissa. Delhi Art Gallery, New Delhi. 1939 First Prize, All India Exhb. of Fine Arts, Lahore. 1946 First Prize, International Exhb. of Contemporary Art, New Delhi. 1950 Gold Medal, Academy of Fine Arts, Calcutta. 1961 Awarded Gold Medal, Academy of Fine Arts, Calcutta. 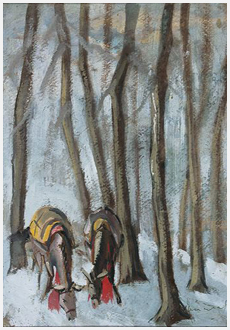 1954 Awarded the First Prize and Gold Medal, Academy of Fine Arts, Amritsar. 1955 Awarded the First Prize and Gold Medal, Academy of Fine Arts, Amritsar. 1961 Awarded four Gold medals, including Bengal Governors gold medal for the best work in any medium, Graphics and cash awards. 1963 Mention Award at Sao Paolo. 1973 Honoured by the Sahitya Kala Parishad, New Delhi. 1984-85 Honoured by the Ministry of culture with Emirates Fellowship. 1951 Study tour on invitation by Italian Govt. 1952-53 Study tour on invitation by Norwegian Govt. 1957 Invited by British council, he went to England to teach art at Hailybury an imperial service college. 1958 Head of the Art Dept., Modern School, New Delhi. 1964 New York University gave round the world ticket to travel and discuss the art of teaching method, in different countries.